Carolee was inspired to become a midwife through her own birth experiences and the loving care she received from midwives during her pregnancies. Not only did they provide a beautiful model of care, but also encouraged her in her path to midwifery. 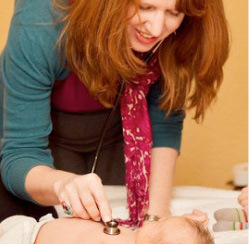 A 2005 Seattle Midwifery School graduate, Carolee preceded her midwifery education with certification as a doula, childbirth educator and lactation educator. During this time she helped found a hospital-based lactation clinic. Breastfeeding support continues to be an important aspect of Carolee's work as a midwife. She returned to Bastyr University in 2017, earning a Master of Arts in Maternal-Child Health Systems where she focused her studies on breastfeeding accommodations in the workplace. Carolee believes in the sacredness of birth. It is her hope to partner with women and their families throughout the passage to parenthood in order to support their birth journey. She believes this is best done by building a close and respectful relationship that honors the family's inherent knowledge of birth while providing information and encouragement. Carolee shares her life with Jay, her husband of over thirty years and together they are enjoying the empty nest life while cheering for their four adult children through the adventures of life. Their loving support and births have made her the midwife she is today. ​Megan felt called to midwifery before she had ever been to a birth! She had the incredible luck of meeting a homebirth midwife in Madison, WI, who took her on as an intern in 2006. These first birth experiences ignited a passion in Megan that led her to Birthingway College of Midwifery, graduating in 2013. Since, she has had the exceptional privilege of working with many birthing families throughout the Pacific Northwest and abroad. Before relocating to Olympia, she worked with the humanitarian organization Doctors Without Borders in central Africa and Haiti. She is thrilled to now be part of the team at Around The Circle Midwifery. Through her midwifery practice Megan strives to improve the way women and families experience pregnancy and family growth. Every family deserves a collaborative and supportive care provider during the powerful and life-changing experiences of pregnancy and birth. In her free time, Megan enjoys spending time with her nephew, traveling and reading novels. Katherine was first introduced to the world of natural childbirth from a young age through her mother, Laurie, who worked as a childbirth educator and played an active role in the prevention of unnecessary cesareans. Laurie was always willing to share teaching materials with her children and was happy to answer any questions they may have had. Katherine was intrigued on an abstract level, and was imprinted with the deep knowledge that birth is a normal and natural process. Katherine has always been passionate about connecting with and supporting people through relationship. She has also always been fascinated with how the body works. Add these two things to a commitment to supporting women’s health and a love of babies, and you have the perfect recipe for a midwife. Her work in L’Arche communities with people with developmental disabilities and as a nanny has all helped to prepare her for the service of midwifery. Katherine is a 2010 graduate of Birthingway College of Midwifery and she attended births as a student under the supervision of both CPMs and CNMs in Oregon. After passing her national board exam, she served hundreds of families as a midwife with a lovely birth center practice in Portland for 6 years before deciding to make the move to Olympia. Katherine is excited to be a part of the Around the Circle community, she plans to continue her work as a midwife with an open heart, a listening ear, and compassionate skill.